It is a history book covering the life-span, deeds, important events in the life of the ten Sikh Gurus and necessary details of the eleventh and the last guru, Shri Guru Granth Sahibji. Written in simple and lucid style it makes an easy and interesting reading. Though the book is meant for all age groups, the focus is on the youth of today, for, the moral and ethical values which the book imparts leaves everlasting message for the readers. 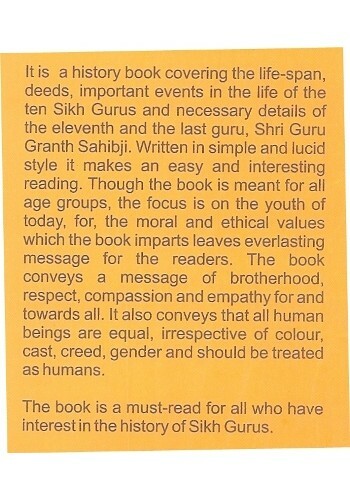 The book conveys a message of brotherhood, respect, compassion and empathy for and towards all. It also conveys that all human beings are equal, irrespective of colour, cast, creed, gender and should be treated as humans. The book is a must-read for all who have interest in the history of Sikh Gurus. Since the creation of universe the process of evolution and revolution has been going on under the very presence and the will of God who is omnipresent, omnipotent and omniscient. The various developments that occured through ages made man a powerful living being who started overpowering other species and fighting hard to bring various energies under his control. His mind, body and various organs developed in such a way as to look upon nature as on object of his use. His faculties of mind and heart began to conquer not only the surroundings but even man himself. God always showered his benedictions in his efforts and inspired him struggle hard discover or invent the ways and means of making himself superior over others. There arose groups of habitation with distinct ways of life, with clear-cut functional setups and distinguished habitual developments of living, eatings, processing, enjoyments, mutual understandings and study of nature. These civilizations constituted new era. The Almighty blessed these civilizations with men of par excellence from time to time. With the passage of time they contributed much to the activities of human behaviour and the highly sophisticated world at large. The Almighty always supervised His man's activities by creating men of His special choice. The activities of man got divided into political, social, economic and religious forms. There were other activities called discoveries, inventions and research. 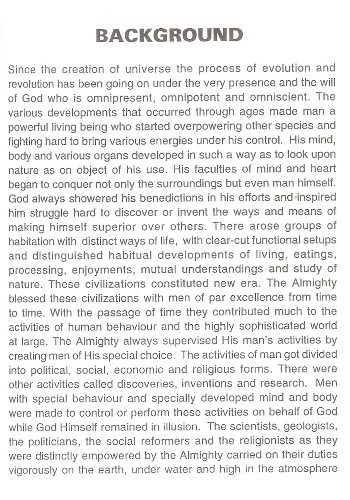 Men with special behaviour and specially developed mind and body were made to control or perform these activities on behalf of God while God Himself remained in illusion. The scientists, geologists, the politicians, the social reformers and the religionists as they were distinctly empowered by the Almighty carried on their duties vigorously on the earth, under water and high in the atmosphere and beyond. But one thing that God did not forget was to keep man bonded. He created five powerful vices called kaam, krodh, lobh, moh, ahankar) lust, anger, greed, affection and vanity which kept man well bound. The only way-out that God allowed was man's embodiment into Him. Man with all his multiple performances had to look to the Almighty for His blessings. God did not forget to send such angels to lead man to the right path. World has seen many a man who came to check man's villainous actions and enlighten him of the truth. The renaissance in Europe and the reformations carried out in the various regions of the world achieved their mission through wisdom, tolerance, perseverance and acuteness with which the angles were blessed by God. All this happened as a consequence of one after the other because the process of evolution and revolution had been a never ending process. The reader will remain mainly confined to this part of the world called Asia and in particular to India which exhibited all such changes of human behaviour through ages. The advent of Aryans brought a great change in the way of life of the Dravidians. The political, social, economic life changed mostly into a new patron. The society got stuck in rigid caste system. Various deities in the shape of gods and goddesses reigned the man's routine activities. The so-called high castes had tremendous influence over the low caste. The woman who had once enjoyed respectful status in the early period of Aryan began to suffer oppression and degradation. The process of deterioration continued because of sham rites and rituals. God did protect masses through his emissaries like Mahavir Jain, Gautam Budha, Lord Krishna and a great number of saints and prophets. But still the process of idol worship, the false rituals remained stagnant and continued the degeneration of society not only in India but in adjacent Asian countries as well. Judaism, Christianity, Islam etc. influenced the society at various places. Hazrat Mohammed brought in great revolution in Medina and Mecca by his credentials of the worship of one God with great vigour and determination. After Hazrat Mohammed his followers, especially the Khalifas made it their mission to spread Islam, to all the neighbouring territories of the world. They became so vigorous in making their mission succeed that they forgot the fundamentals of Islam. The basics of equality, fraternity and service to humanity were set aside. They became ruthless, tyrants, murderers and enemy of mankind. They simply believed in converting people to Islam by pursuation or loot, destruction, burning and conflicting horrible atrocities. The hoards of followers of Islam moved under fanatic and zealous leaders and carried fire and destruction wherever they went. Their cruelties and barbarism became a horror of the territories around. The entire population of Arabia, Turkey, Egypt and many adjoining countries like Iran, Morocco were converted to Islam. These Islamic bigots proceeded to Afghanistan, Baluchistan and many places in central Asia. India too faced the butchery by the invasion of Mohammad-bin-Qasim in 712 A.D. Again, the invasions of Mehmud Gaznavi and Mohammad Gouri brought in the devastation of hundreds of Hindu temples, killing of thousands of Hindus and enslaving thousands of them by carrying them to Afghanistan and other parts in the central Asia. They committed all types of atrocities on women folk irrespective of their caste, creed or religion. These invaders set up their rule in the India under Sultan Qutubu-ud-Din Aibak in 1206 A.D. These Sultans established a type of theocracy falsely derived from the Islamic laws. Various dynasties, the Slave, the Khilji, the Tughlak, the Sayyads and lastly the Lodhis were all cruel toward the Hindu masses. They destroyed hundred of temples, killed thousands of people, burnt hundred of villages and committed all sorts of atrocities upon the Hindus. The invasions of Changheze Khan and Timur were still more barbarious. These rulers succeeded in converting large number of low-caste and the poor to Islam. The Rajputs too fell a prey to them. Such was the horrible condition of the masses when another Holy man, Guru Nanak born in 1469 at Raiboe-di-Talwandi in the district of Shekhupura (now in Pakistan) and lived upto 1539 A.D. The contemporary Sultans were Bahlol Lodhi (1451-1489), Sikandhar Lodhi (1489 to 1519), Ibrahim Lodhi (1517-1576). Babar, the Mughal Emperor from Afghanistan, started his invasions in 1518. He invaded India five times in the years 1518, 1519,1520-21, 1524 and in 1526 when Ibrahim Lodhi, the last Sultan, was defeated and killed. The Mughal Emperor Babar occupied the throne of Delhi. Kind disposition granteth consolation. He gives orders to the cloud and the rain falleth in torrent". The Social and the political conditions prevalent in the country for one and half century of the Sultanate period prepared grounds for some relief through Sufi saints and the Bhagats. 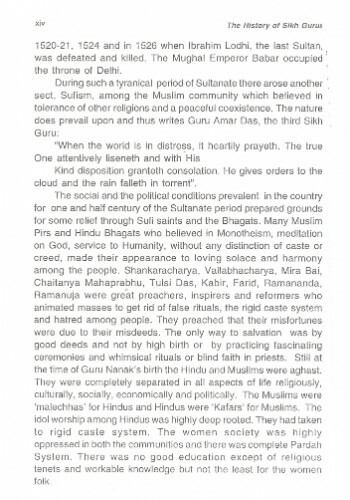 Many Muslim Pirs and Hindu Bhagats who believed in Monotheism, meditation on God, service to Humanity, without any distinction of caste or creed, made their appearance to loving solace and harmony among the people. Shankaracharya, Vallabhacharya, Mira Bai, Chaitanya Mahaprabhu, Tulsi Das, Kabir, Farid, Ramananda, Ramanuja were great preachers, inspirers and reformers who animated masses to get rid of false rituals, the rigid caste system and hatred among people. They preached that their misfortunes were due to their misdeeds. The only way to salvation was by good deeds and not by high birth or by practicing fascinating ceremonies and whimsical rituals or blind faith in priests. Still at the time of Guru Nanak's birth the Hindu and Muslims were aghast. They were completely separated in all aspects of life religiously, culturally, socially, economically and politically. The Muslims were 'malechhas' for Hindus and Hindus were 'Kafars' for Muslims. The idol worship among Hindus was highly deep rooted. They had taken to rigid caste system. The women society was highly oppressed in both the communities and there was complete Pardah System. There was no good education except of religious tenets and workable knowledge but not the least for the women folk. Under such chaotic political and social conditions the Almighty sent a Holy man, Nanak, to guide and lead the people to the path of righteousness. He taught to the people the life of tolerance, affection, brotherhood of mankind and Fatherhood of God. The teachings of Guru Nanak were simple, consistent, systematic and distinct. He talked of salvation of man through meditation on the name of God, noble deeds and service to others. He disdained the path of blind faith, the wasteful rituals and the privileged and unprivileged division of caste system. He believed in the equality of mankind of both the sexes. He carried on his mission by his vast travels in India and abroad. Everywhere he was accepted as the "True Guru". He made his followers to continue his mission for centuries. 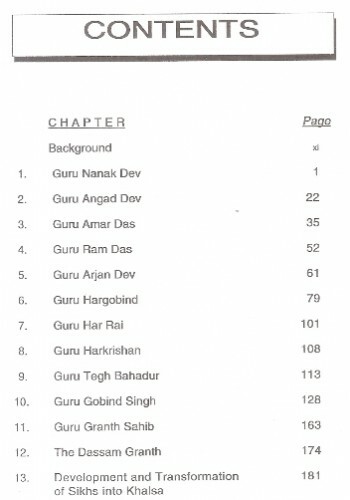 This book, I believe, will help for the study of history of each Guru in the following pages. The background will be incomplete without a word of thanks to Prof. Pritam Singh Dham (former Reader of Sri Guru Tegh Bahadur Khalsa College, Delhi) who inspired me to take the job of this work in my retired life. I am thankful to my son-in-law, S. Updesh Singh Sachdeva, former Assistant General Manager of a Public Sector Bank and author on Banking Law for his role in reviewing and guiding in my attempt. Lastly, I am thankful to Lotus Press for giving a final shape to the book and to the Almighty for giving me strength and lease of life. Prithi Pal Singh, was born in a village in Sialkot, Pakistan, a place visited by the first Sikh Guru, Shri Guru Nanak Devji. Son of a school Head Master, Sardar Mool Singh came to Delhi with his family in the year, 1947 when the country was partitioned. He graduated from the Punjab University and later did his post-graduation in History from Aligarh Muslim University. Though he had the occasion to work as an Archaeological Officer with Delhi Administration, he chose teaching as the profession of his passion and retired as a Principal from Directorate of Education, Delhi. He held the post of an honorary lecturer in a girl's college in Delhi, for more than eight years. 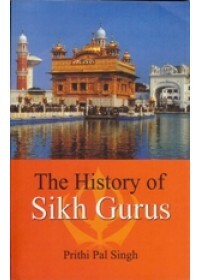 Since the author throughout remained a keen student of History especially the Medieval History, after his retirement he started studying the history of the Sikh Gurus even more deeply. The outcome is this book, the first one of the author. 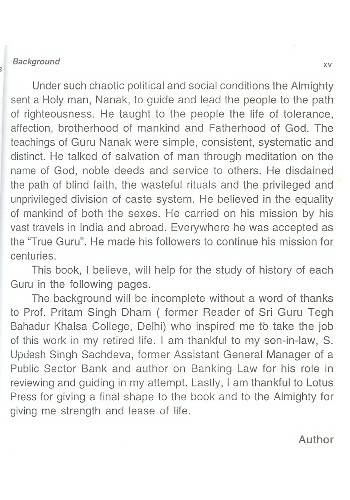 Preface Of The Book 'Sikh Gurus - Their Lives and Teachings' By K.S.Duggal I belong to a devo.. Preface Of The Book 'The Lives And Teachings of the Sikh Gurus' By Harish Dhillon At the time of ..
Introduction to the Book 'Guru Arjan Dev' By Dharam Singh The story of the ten Gurus, or spiritua..
Summary of 'The Japji And The Rehras' By Khushwant Singh I am not a religious man, but I ca..
Introduction To 'Guru Nanak And The Indian Society' By Harbans kaur Sagoo Guru Nanak Bani has..